When you are planning to extend a family, then you would know the importance of a healthy reproductive system. It takes more than one healthy organ to become parents successfully like healthy ovaries that produce an egg every month, healthy uterus, functional fallopian tubes through which the sperm reach your egg, healthy sperm count and motility, etc. If the fallopian tubes are blocked then getting impregnated is impossible. Therefore, in such cases, your doctor will diagnose it with a test called hysterosalpingogram or HSG. 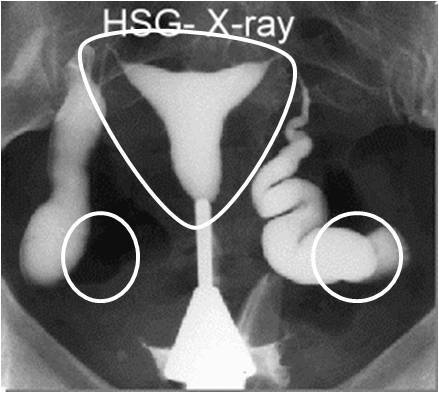 Hysterosalpingogram (HSG) is a procedure or test which uses an X-ray to look at your fallopian tubes. It is performed by a trained gynecologist and is accompanied by an X-Ray technician and an anesthesiologist if it is being done under GA. If the anesthetist has declared the patient as fit for GA, then the patient preparation process starts a one hour before the procedure. The patient is given the necessary medicine, change of dress, etc. The patient is then moved to the HSG room. Then X-Ray photographs are taken of the lower abdomen area. All blocks and structural anomalies of the uterus will be revealed in the x-ray film. The patient is then shifted to the recovery rooms. In most cases, the patient recovers from the effects of anesthesia in about 15 minutes. The patient is discharged from the hospital in about 2 hours – after food and liquid intake without vomiting. Based on the findings in the HSG procedure, the doctor will suggest the next steps. Ensure all medication and injections are taken as per doctor’s advice. This includes the date and time of drugs. Inform the doctor about any allergies, infections, asthma, etc. A personal assistant may be needed on the day of HSG since the patient will be under the effect of anesthesia for some time. It is preferable to leave all expensive jewelry at home before coming for HSG. This is because all of it may have to be removed before the procedure. What are the Do’s and Don’ts after the HSG procedure? Typically, an HSG procedure should not take more than 30 minutes. There is some amount of patient preparation that needs to be done, and that takes about 1 hour. If the HSG is done with local anesthesia, then the patient can be discharged in about 1 hour after HSG. If both tubes are blocked, the doctor may suggest IVF as an option. If there are structural anomalies in the tubes, uterus, etc, other corrective procedures may be suggested.